I am a stupid monkey. The current extra curricular aim of the moment, other than attempting to play the guitar (but rather lazily opting for Kate Nash songs that require no real talent) is learning to read Thai, or at least understand the Thai alphabet so that I can un-code the many things around me in Thai script such as signs (we are never quite sure if we are walking past ‘no entry’ or ‘danger’ signs) and menus (oh to order more than just the four things we order every time because we know that particular place sells it!). 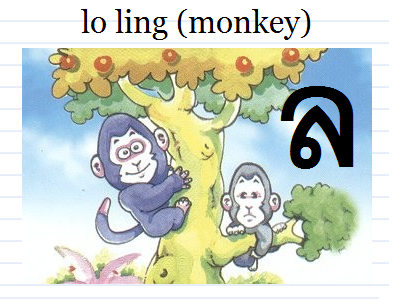 The first step was to look at the consonant sounds that are in my name and find the corresponding Thai letter. And this is where I found out that my name features two lovely animals. You see, each Thai letter has an accompanying name or object (similar to our A apple, B ball, C cat) but unlike our version this doesn’t stop being used once people grow up, and each letter continues to be referred to using it’s full name. 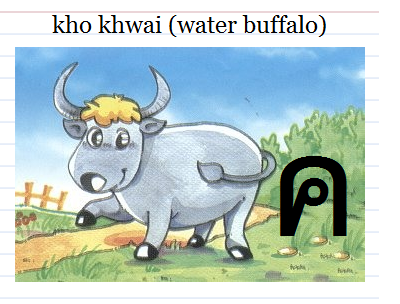 So, K is kor kwai, or buffalo. Buffalo are slow, and seen as stupid in Thai culture especially when being atributed to a person (buffallo is often shouted as a taunt in the classroom, usually at big, oafish and slow boys). Next we have L, or lor ling. Monkey. Teacher. Oh foudn great joy in informing me that this makes my name, in the literal sense, mean STUPID MONKEY. Thanks!